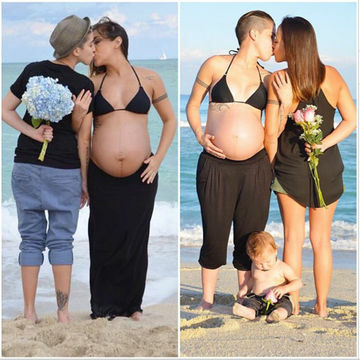 An awesome side-by-side photo comparing a lesbian couple's two different pregnancies goes viral on Facebook, making a huge impact in the LGBT community and beyond. When Melanie and Vanessa Iris Roy, a couple from North Carolina, posted a gorgeous pregnancy photo, they had no idea the impact it would make. The split-screen Instagram post features two photos of the couple kissing taken one year apart: The first when Vanessa Iris was pregnant with their son Jax in January 2014 and the second when Melanie was about to give birth to their daughter Ero in January 2015. "Trading places," wrote Melanie in the caption. Shared in February, the pic has only now gone viral, after receiving acclaim on several LGBT websites, including a Brazilian advocacy page where it's received over 160,000 likes and more than 20,000 shares. "It's crazy to see that people were referring to my family as an inspiration," Melanie told The Huffington Post. "We are still in complete shock." The Roys hope the viral image can serve as encouragement to other lesbian couples considering children. "Vanessa and I have always said we would both like to carry," Melanie said. "The woman's body is incredible. The way it creates and grows another human being is amazing. We hope that our picture is the sign that some women may need to encourage them to carry a child."